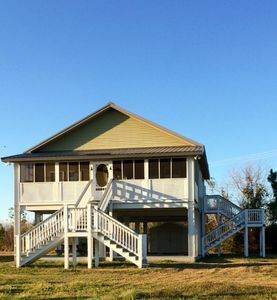 This house is conveniently located : 5 to I10 interstate hwy, 10 minute to Old Town Bay St. Louis, 40 minutes to New Orleans French Quarter, 2 mile to the beach , 1 mile to shoping . 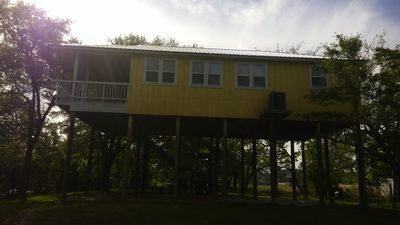 Kingfisher Tree House is well apointed 2 bedroom, with a queen sixed bed in each bedroom and 2 full baths . 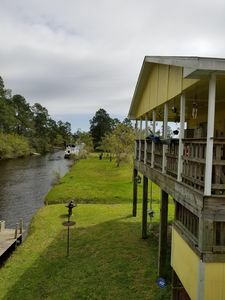 The cottatge also has a washer and drier, central ac /heat ,stove and refrigerator and microwave in the kitchen with a large deck with a pourch swing,the deck overlooks a bayou/ canal that leads to the Jourdan River , 20 minutes by boat. A great location for a family get away. 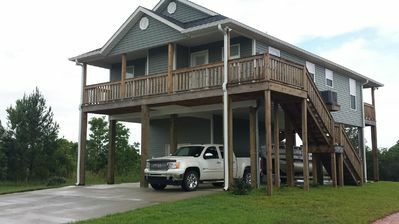 Bay St. Louis House w/ Private Pond - Near Marina! This beautiful home is located on the south shore of the Bay of St. Louis. 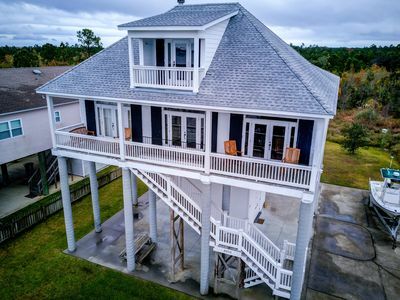 It features 4 bedrooms (1 king and 3 queen), 2 full bathrooms, open kitchen/dining/living area, spacious front porch for viewing the sunsets across the Bay or enjoying a relaxing morning. And for convenience , there is a state-of-the-art residential elevator. The home sleeps 8 comfortably and also has an upstairs room with a futon. Also included is access to fishing and crabbing, boat docking or just lounging on the 200 foot long pier. 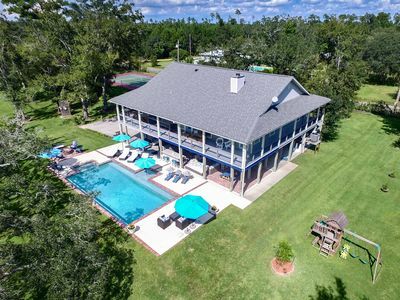 This home is located less than 1/2 mile from a public boat launch, 2 mile from the beautiful Gulf Coast white sand beaches, and 1/2 mile from old downtown Bay St. Louis, and Casino Magic and the Bridges golf course is just a couple of blocks away. This is a no-smoking inside and no pet home! NEW! 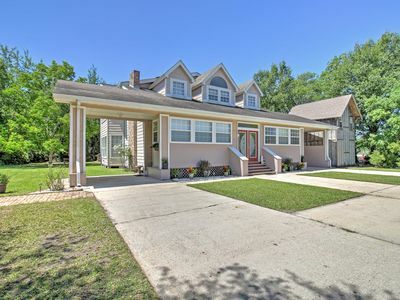 Walk to Beach from Charming Waveland Home! 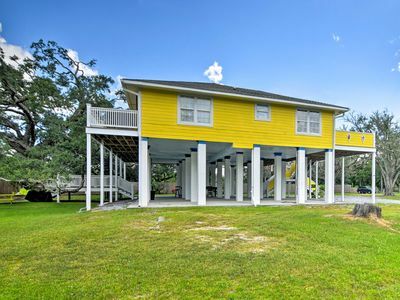 Spacious Waveland Home w/ Deck - 5 Mins to Beach! 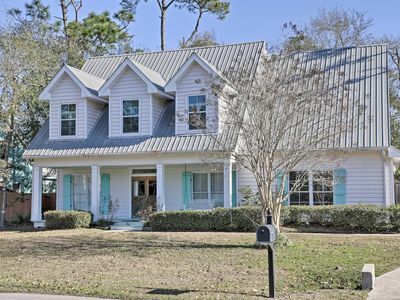 Cozy Bay St Louis Home w/Yard, 0.25 Mi to Gulf! NEW! 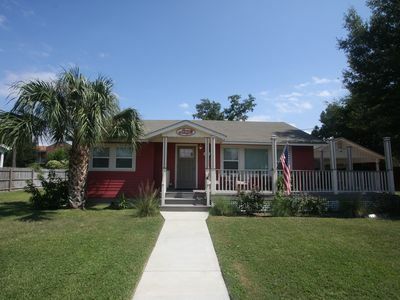 Dtwn Bay St. Louis Home - 1 Block to Main St! Spacious 3 Br Beach House, Only 1 1/2 Blocks From The Beach! It's the location!! 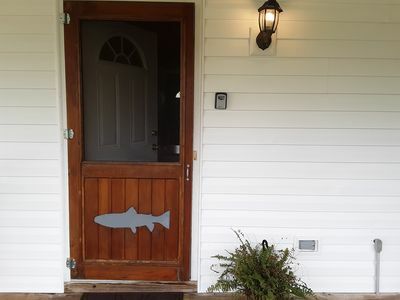 Adorable 3-bedroom, 1-bathroom house just one and a half blocks from the beach and Washington St. fishing pier. 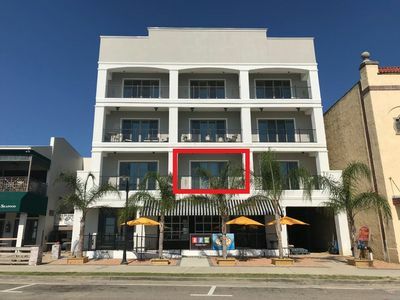 The best location in Bay St. Louis, with the beach in your view at the foot of the street, and walking distance to Old Town, beachfront, and Depot District shops, bars and restaurants. This spacious and sunny fully-furnished house has a living room (with comfortable queen size sofa bed), a dining room with a long six-seat dining table, an enormous fully-equipped kitchen with new appliances, a sun room for your morning coffee with a table and four chairs, two large carpeted bedrooms with mahogany queen-size beds, chest of drawers and night tables, and a small bedroom with a double-size futon. 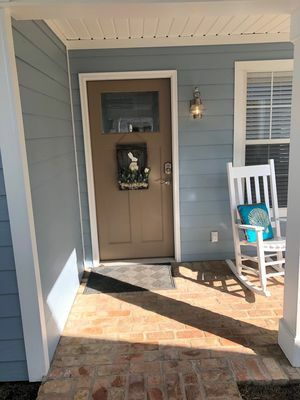 There is also a pleasant front porch with wicker sofa, chairs and table, and a large fenced back yard with a patio, covered dinette set with umbrella, and barbecue station. 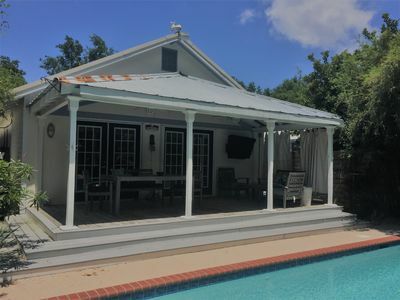 This lovely historic house has intricate plaster molded ceilings and architectural details, ceiling fans in every room, central air and heat, and a newly-remodeled bathroom with a large bathtub. There is also a separate laundry room with a full-size washer and dryer for your use, parking for two to three cars in the driveway, high-speed internet and wifi, and cable television in most of the rooms. Convenient transportation all over town by the free Bay St. Louis trolley that comes by the house every fifteen minutes or so. You can also rent a golf cart to motor around town and along the beach. MONTHLY RENTER PREFERRED - message us for extended stay rates. 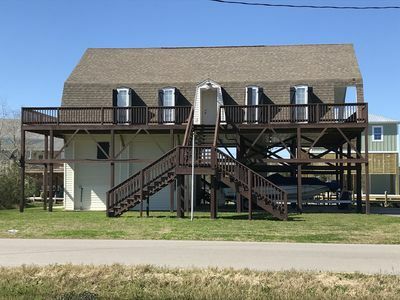 Sunset Cove is part of a 3 condo unit in a quiet residential area convenient to everything that makes visiting Bay St. Louis, MS great - our beaches, harbor, casino and downtown are all within a 2-mile circumference. 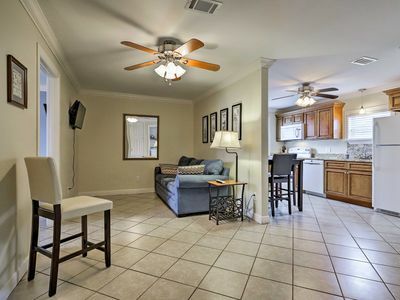 This townhouse is the perfect place call home for a week / month or even a few months if you want to linger longer, are finishing up a home build, doing short-term contract work, escaping a cold winter or want to explore our region - you're just an hour from New Orleans or Mobile! 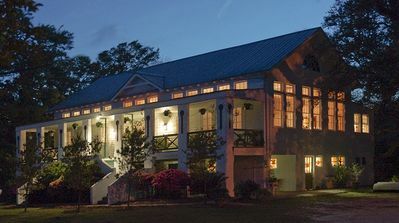 Bright and welcoming, Sunset Cove offers guests a calm retreat during a stay in the Bay. Downstairs is a roomy dining room with seating for 6, a fully-stocked kitchen, half-bath and laundry room. A sunny living room with a TV, reading nook and a desk area opens to a private back courtyard with a charming outdoor dining area - perfect for coffee or cocktails. Upstairs are two large bedrooms, both with TVs and Roku's to stream you favorite movies and shows. Plenty of closet space, large windows and comfy bedding. A shared bath is off the hallway, convenient to both bedrooms. Off-street dedicated parking is provided for up to 3 cars. This is the only short-term rental in this complex and the other two condos have dedicated parking as well. Guests have the entire townhome to themselves, including private courtyard. Our home is located just 3 minutes away from Sunset Cove so we're right around the corner should you need us for any reason. We can meet you to show you around if needed or you can just let yourself get settled in and enjoy the privacy. Sunset Cove is located in a residential neighborhood, just off of Highway 90, about a mile from the beach. Restaurants, grocery and wine store (owner's favorite!) are located nearby. Sunset Cove is very close to downtown restaurants and shops and bars - about 1.5 miles - but out of the hubbub when you want to relax. Bay St. Louis has great walking / biking paths that run alongside our waterfront. Or park at the base of our bridge and walk the dedicated walking path there, checking out our bronze markers - art made from our Katrina-destroyed bridge metal by some of our best local artists. Kayaks, paddleboards, bikes and golf carts are available for rent just a few blocks away. Bay Haven is located 1.5 blocks from an amazing beach with public facilities and is within walking distance to Old Town Bay Saint Louis. 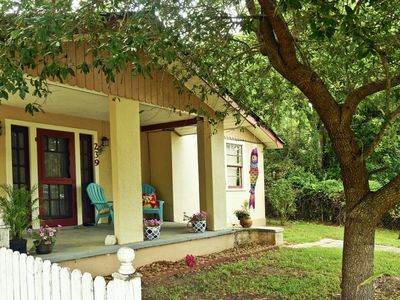 Bay Haven features a darling front porch with a swing. Enter into the first of 2 living spaces, which is expertly decorated with the beach bohemian theme that runs throughout the entire home. There are 2 bedrooms, one with a queen-sized bed and the other with 2 full-sized beds. A jack and jill bathroom joins the 2 rooms, which features a clawfoot tub with a shower surround and plenty of storage. The kitchen is efficient featuring all appliances needed and a small island with 2 barstools. The living space in the back of the home is a wonderful family space. It boasts a sectional sofa with TV and also a desk that can be pulled out to be a dining table. The 2 sets of French doors open to the deck and pool area. The second bathroom is off this living space and features a beautifully tiled shower. This bathroom is quite convenient for pool use as it is just off the back door. The covered deck overlooks the pool and offers a tranquil dining experience, seating up to 6. There is also a small seating area, along with an outdoor TV. The stunning saltwater pool tops off this extraordinary property. We have 2 cruiser bikes, along with a bike cart (safe for beach toys/chairs/cooler, not safe for children) that attaches to one of the bikes, available for your use. Beach toys, beach towels, and 2 beach chairs are also provided at this time. Come stay at Bay Haven! 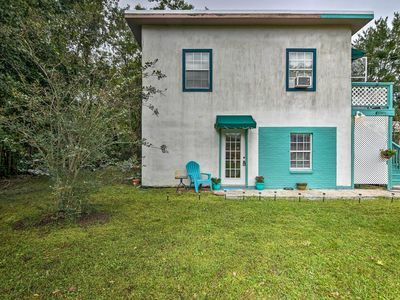 This property is managed by MANIERI REAL ESTATE, LLC Convenience and Comfort, This Charming 2 bedroom 2 bath cottage with hardwood floors, is located within walking distance of the beach, shopping and restaurants. All the comforts of home with, cable television, internet, washer & dryer. Kitchen is equipped for cooking and dinning inside. Includes 2 futons for extra sleeping arrangements. Wrap-around open deck for catching some sun. Bar-B-Q grill on deck Large fenced yard. If you don't want to walk, you can rent golf carts or bicycles. Regardless if you walk or ride, you will enjoy the serenity of Old Town, Bay St. Louis. A single bedroom which is attractively tucked in pleasant surroundings. Perfect for a couple for a private get away. Tastefully decorated with an equipped kitchen. Upstairs in the loft is a unique setting which includes an additional bed and room to stretch out and relax. Loft has balcony overlooking the pool. It is located within walking distance to restaurants, bars, harbor and shopping. Downstairs living room and upstairs loft are both equipped with tv, Living room has double doors which open to the patio pool area. It is just the thing one, a couple or a few could enjoy without cramping one's style. Sandy beach is only a three minute walk. 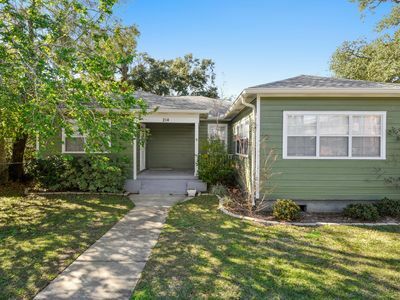 Our three bedroom two bath home located deep in old town Bay St Louis Mississippi sits under a canopy of historic oak trees. Wireless internet, cable, hardwood floors, tile bathrooms, and fully stocked kitchen make this home an easy get-away adventure. Satellite map shows our home is located on the widest beach in town. The beach experience will feel like your own private access as we are situated in a quiet neighborhood. Experience the natural beauty of the area by use of our bikes or kayaks. The shed on the property contains all of the beach gear (chairs, carts, toys) that are for use by our guests. Whether you are looking to host a craw fish boil or game of football in the expansive backyard, the large acreage (nearly an acre) will give you plenty of space to unwind. Dreams really do come true when you stay at Forever Sea Inn! 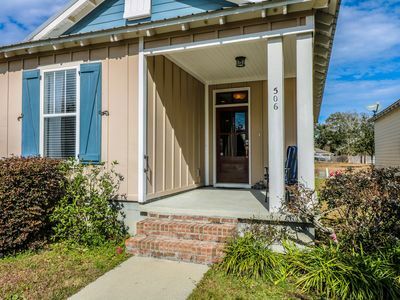 Just 1 mile to the beach and 2 miles to Old Town. Our home is set in a quiet beautiful neighborhood. A perfect place to stay after a long day of exploring! 3 bedrooms and 2 bathrooms with just over 1700 sq ft is plenty of space for everyone to sprawl out. 2 king beds and 2 sets of bunk beds (twin over full) is enough room for 10 people to stay comfortably. The large open living/dining/kitchen makes relaxing and meal time easy for everyone to enjoy together. Home is updated and virtually like new. We have provided you with everything for your stay. Just bring clothes and food! BEACHFRONT DOLCE VITA - "The Sweet Life"
SPECIAL FOR AUGUST AND SEPTEMBER, WEEKLY RATE JUST $1850/WEEK!! MONTHLY SPECIALS ALSO AVAILABLE. 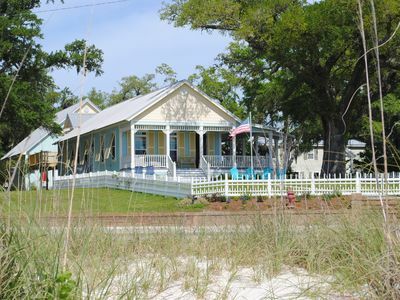 Get your toes in the sand and enjoy panoramic views on wraparound porches with this classic coastal beachfront cottage and studio right on the Gulf of Mexico. Framed by ancient moss-covered oaks, this property offers two for the price of one. 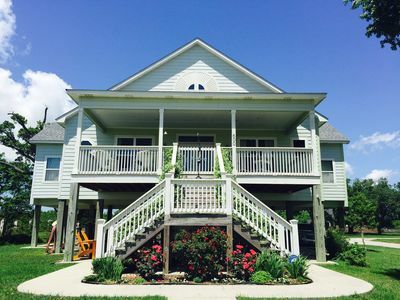 With a total of 4 bedrooms and 3 baths, the main house offers 3 bedrooms and 2 baths. The house has views abound and provides an open living area with bar and dining table for eating. The kitchen is fully equipped for those who enjoy cooking. The home also offers the conveniences of cable and internet if you need to stay connected. The adjacent studio provides beautiful retreat with a queen bed, a 3/4 bath, fully equipped kitchenette, television. 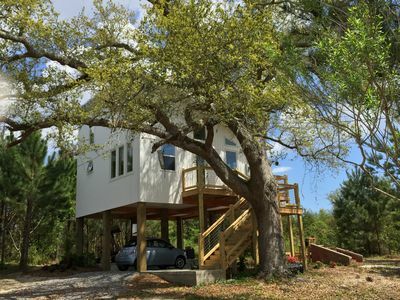 Relax on the fantastic 200 square foot deck with view of the oaks and the beach. Come enjoy the amenities provided including bicycles for the short trip to Main Street, a grill on the patio or relax on the Adirondacks on the beach waiting for you. This property has a small fenced yard, and the owners will consider pets pending on breed, size & training. BSL Living offers the Blue House, Unit B, with 2 bedrooms and 1 full bath less than four blocks to downtown Bay St Louis and the beach. Sleeps six comfortably, with room for 8. Remodeled in 2018 so all new systems/appliances. Main level has 2 bedrooms (1 queen double and the other with 2 sets of bunk beds that sleep 6); with shared full bath (tub/shower); kitchen with electric stove/double oven, double-door refrigerator/freezer, microwave, dishwasher and sink disposal; dining area with seating for six; living area with TV, comfortable sofas and laundry room with stackable washer/dryer; streaming cable TV and Wi-Fi. On demand hot water heater, so no possibility of running out of hot water. Located directly across from public park with splash fountain and play set (ideal for children of all ages). Within 4 blocks of the beach and historic downtown area dining and entertainment. Amenities • Central Heating/Air Conditioning • Washer & Dryer •	Streaming Cable •	Wi Fi •	TVs •	Children Welcome •	Internet •	On demand hot water •	Parking Bathrooms •	Bathroom 1 Combination tub/shower, double vanity, shared bath on main level. •	On demand water heater, so no running out of hot water. General •	Central Heating/Air Conditioning •	Linens and Towels Provided •	Stackable Washing Machine and Clothes Dryer •	Parking in carport •	Wi-Fi Wireless Internet •	Towels and Linens Provided •	Living Room Kitchen •	Dishwasher •	Refrigerator with ice maker •	Stove, electric •	Double Oven, electric •	Microwave •	Coffee Maker •	Toaster •	Pantry Items •	Dishes & Utensils •	Kitchen Electric stove/double oven; double-door refrigerator with ice maker; microwave; dishwasher; sink disposal; coffeemaker and toaster. Dining •	Dining Area Dining table with seating for six. Entertainment •	Televisions, main living and master bedroom •	Streaming Cable Service •	Books •	Games for the ages. Outside •	Park with splash fountain and playground. •	Lawn •	Kayak / Canoe / Bicycles - We have none. Can be rented in downtown Bay St. Louis. Suitability •	Wheelchair not accessible - We're sorry, the house is not ADA compliant. House Rules Check-in: ?3?:?00? ?PM Check-out: ?10?:?00? ?AM Children welcomed Minimum age of primary renter: 25 Max occupancy: 8 No parties/events No Smoking No Pets Cancellation Policy 100% refund if canceled at least 30 days before arrival date. 50% refund if canceled at least 14 days before arrival date. This is a 2 bed 1 bath elevated home. 5 min to the beach. The master bedroom has a queen bed and 2nd bedroom has a double bed. Central ac & heat. 50'' 4k TV (satellite with DVR, 200+ channels). Kitchen is fully furnished (fridge, microwave, oven, coffee maker, dish washer, etc.). Washer and dryer. Outside has picnic table, chairs, charcoal grill, bb court, 3 bikes, parking for car/boat, & 2nd half bath. Bay St Louis has miles of side walks at the beach for bike riding & walking. A safe place close to everything. Self check-in. They key will be in a combination lock box. A great place that has canals all through the neighborhood. Very safe and close to everything. Beach is 5 minutes drive. Walmart is 3 minutes drive. Bay St Louis has miles of side walks at the beach for bike riding & walking/jogging. Old Town Bay St Louis has an awesome nightlife, golf cart community, great live music and food. Guests can have access to anything inside the apartment, front and back balconies, and anything under the 14 foot high elevated house. There is a GREAT entertainment/relaxing area under the home including a large half bathroom. About 1,000 square feet of covered concreted area. 3 Bikes. 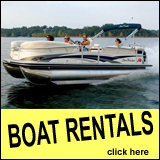 Basketball court, picnic table, chairs and charcoal grilling area, car and boat parking, and local boat launches. Quiet home only minutes from the beach, restaurants, and activities. 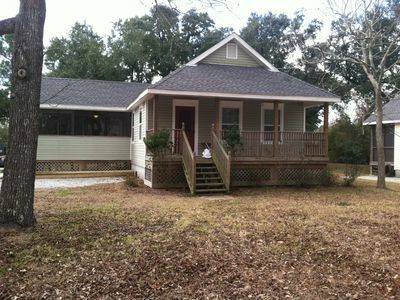 Four bedrooms, two bath family home with large den, full kitchen and dining room. Fenced in back yard for peace of mind for harried parents. Fully furnished; just bring you personal items. Family friendly; not fru-fru but completely comfortable. Easy access to beach, shopping and restaurants, but a perfect get-away from the hustle and bustle of crowds. WIFI with SmartTV for Netflix. Antenna with access to a few local stations. Only 56 miles from Superdome! 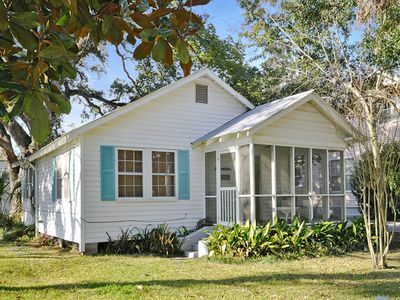 Garçonnière, a freshly renovated 2 bdrm, 1 ba cottage, Old Town Bay St. Louis. This recently renovated 1200 sq ft cottage, known locally as “Garçonnière”, is bright and sparkling clean with comfortable indoor and outdoor living areas. Features: •	Master bedroom with comfortable queen-size bed and TV •	Guest bedroom with twin beds •	Quality new mattresses and bedding in both bedrooms •	Renovated bathroom with rain head shower •	Outdoor shower with hot water •	Large den with new queen-size fold-out couch and TV •	Sitting room with comfortable reading chairs and library •	Dining room with seating for four •	Recently renovated kitchen – fully equipped for an extended stay •	Refinished original wood floors throughout the house •	Screened-in front porch surrounded by live oaks •	Bicycles for your use •	Rear deck with Adirondack chairs and gas grill •	Off-street parking for one car, arrangements available for second car •	Washer and dryer in the garage with complementary laundry supplies •	Beach chairs, beach towels, and coolers available •	Wireless high speed internet and cable TV •	Managed & maintained by MANIERI REAL ESTATE, LLC This historic beach home is locally known as “Garçonnière” (a Louisiana French term for bachelor quarters). It stands out for two reasons. First, location -- The cottage is on a quiet residential street in the heart of Old Town within easy walking distance to beaches, restaurants, shopping, and entertainment. And second, renovation -- with an eye to historic preservation as well as modern comfort, Garçonnière was professionally renovated and decorated in 2015. The owners have created a comfortable guest house they use to host family and friends. Between these visits, this sparkling clean and bright beach cottage is available for your vacation. Beautiful 1 bed 1 bath spacious condo professionally decorated. Private Balcony and all amenities needed. Walk to Restaurants, Bars and Shopping. Private off street parking space. Across from Harbor and steps away to all of the exciting activities Bay St. Louis has to offer. Sit on the balcony and enjoy the views. There is a 3 night minimum for Cruisin the Coast, Easter, 4th of July, Labor day Memorial day and $275.00/nt No booking will be accepted for any reservations less than this! 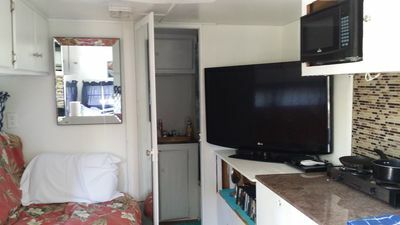 This 20-foot nice camper is located under my elevated home 5 minutes near the beach in Bay Saint Louis, Mississippi. Camper and sitting/picnic area are all covered under the house. Inside you will find all the comforts you will need for your stay, kitchenette with coffee pot, microwave, 2 burner stove top, bed, futon, full bathroom with shower/small tub, 42-in flat screen, and DVD. Outside you will find a picnic table, charcoal grill, chairs, basketball court, parking for car and boat. There is also an extra (2nd) half bath. We have 2 adult bikes and 1 kid bike. We are located in a great place that has canals all through the neighborhood. Very safe and close to everything. Self check-in. The key will be in the lock box with its code. Boaters Delight!!! This camp style vacation home sits on a deep canal leading to the Jordan River! Offering its own boat launch, fully equipped kitchen, and upper level kid loft! This home has specialty amenities for each member of the family to make delightful vacation memories!! This is a pet-friendly home! To keep our home beautiful for your enjoyment, an additional pet charge will be required at the time of payment processing. Please let the management know if your fur baby will be traveling with you! La Petite Cachette is a completely restored "barge board" private home, listed on The National Register of Historical Places. 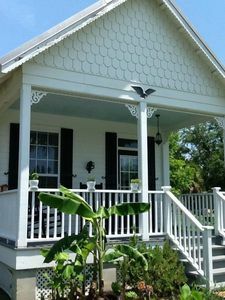 The Main House features a creole porch with four hand-made Mississippi rocking chairs. This is a great place for morning coffee or afternoon libations with friends & family. This is the spot to take in a good book or just to enjoy the peace and privacy of La Petite Cachette. The living room is a very cozy space for relaxing and watching TV. It has a large sofa, comfortable chairs, & a flat screen tv with a DVR. The living room opens to a spacious dining room. The dining room table has seating for 8 people and is decorated with the works of Mississippi artists. The chandelier is a family heirloom. The impressive pocket doors are restored and underscore the historical nature of this property. The kitchen has been renovated & is fully equipped with 2 sets of dishes for 8, 2 sets of stainless flatware for 8, a large variety of cooking utensils, various pots and pans for cooking, oven bakeware of various sizes, and barware. There are 2 refrigerators: one vintage restored Philco refrigerator and a modern one with an icemaker on the screen porch. Appliances include a gas stove, a dishwasher, and a microwave. Small appliances include a coffeemaker, a toaster, a crockpot, and a blender. The screen porch is accessed off of the kitchen and allows for outdoor dining. The porch also overlooks the pool and patio area. The guest bedroom is well appointed with a queen size poster bed, a chest of drawers, night stands, bedside lamps, & generous closet space. 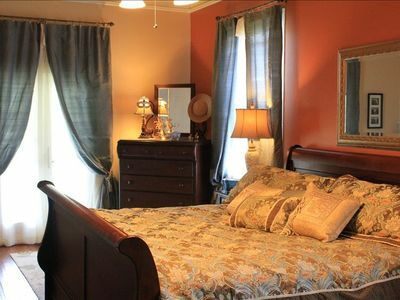 The guest bedroom has 2 large windows & custom French doors which open on to the front porch. The bathroom is ensuite with a shower/tub combination. The bathroom is handicap accessible. The master bedroom entrance is off the dining room through handmade French doors. There is an heirloom French bedroom suite with a queen bed and two large dressers. Also in the bedroom is a built-in work station with a flat screen TV. The bedroom has two large windows that allow natural light in the room. There is an ensuite bathroom with a vanity and dressing area with built-in barge board cabinets. The bathroom has two pedestal sinks and a six foot soaking bathtub/shower combination. The sunroom is located at the rear of the house. This is a beautiful sunlit room with barge board shelves and cabinets from reclaimed wood from the New Orleans area. There is a vintage English breakfast table with balloon chairs. This is another great place for morning coffee. The windows and doors have custom made curtains and to allow for privacy. The sunroom has a half bath and can be used as a third sleeping space. The couch is a queen size sleeper sofa. The laundry room has a washer and dryer and rods for hanging clothes. The laundry room is located in the back portion of the house and can be accessed from the sunroom. The pool is private & is located in the backyard area of the property. There are bicycles located under the carport for guests to use during their stay. *Please note this is the 'Main House' (VRBO #489053) and there is also another accommodation in the upstairs 'Guest Quarters' (VRBO #472872) listed separately. The pool is shared by the guests in the Guest Quarters and the Main House. We allow pets on an individual basis. Please call for questions. We DO NOT allow receptions or weddings, rehearsal dinners, showers, stag parties, bachelor parties, large parties, etc. on the premises. Guests must be at least 25 years old. If you have questions please contact us. Be one of the first to stay at this newly renovated vacation rental! Welcome to your southern beach oasis. Newly renovated 3 bedroom house is the perfect get away with excellent amenities. Tastefully decorated with new furniture, it includes an equipped kitchen with new stainless steal appliances and all of the comforts of home. 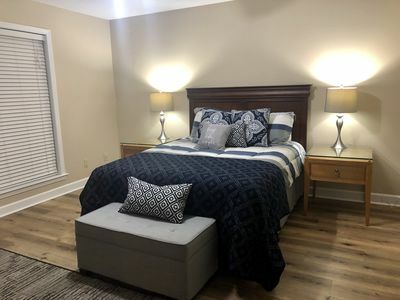 The three bedrooms include a king and two queen beds all with high end mattresses, luxury bedding and "Dacron" pillows for a comfortable night’s sleep. An open floor plan is perfectly designed to entertain multiple guests. Enjoy a family gathering or a friends retreat away from it all, with games like Monopoly and Yatzee to fill up an evening of fun . A short 10 minute walk will bring you to Old Town Bay St. Louis and to the dog friendly beach or jump on the golf cart included in the rental. It’s a comfortable home that is great for enjoying a "night in" especially with games like corn hole and board games to entertain your group.. A large backyard gives you plenty of space to stretch out and play with kids and dogs or to just kick back with friends and relax. After a gorgeous day at the beach, return to your oasis and enjoy the delights of the full body massage chair to enhance your relaxing vacation. A wireless speaker is available to hook up your phone or computer to enjoy some of your own tunes. Plush hotel style cotton towels are an ultimate luxury for your refreshing bath. A limited number of beach chairs and beach floats are also available. Other amenities include cable tv, wifi, and an in-home-filtered water system. Cable TV's are also included in the living room and 2 of the 3 bedrooms. The house is located in Old Town Bay Saint Louis and is just a short walk to the beach, but why not cruise in style like the locals on the 4-person electric golf cart that is included in each rental! 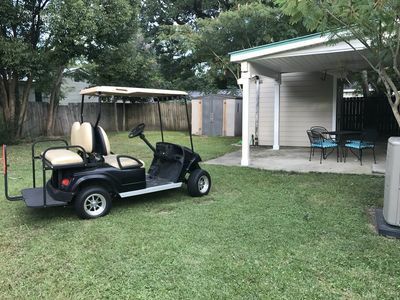 This 2011 golf cart is road ready and is the perfect way to enjoy the old town restaurants, bars and shopping, or make a speedy trek to the beach which is just 3 short blocks away. Come down to enjoy the beach, this quaint town filled with great restaurants, bars and shopping, all while enjoying the comfort and amenities of this southern beach oasis. *** Please note, prior to check in, please submit a valid drivers license and proof of auto insurance for those guests that will be operating the golf cart in order to get lock box code to the golf cart keys. Please note that guests are renting the home and the golf cart is an amenity. Should their be issues with the golf cart during your stay, we will do everything we can to assist with making sure it is available for use, however if it breaks and it is in need of repairs, guests will not have use of it. *** If you are bringing your fur babies to the house, we need to make sure that each one is: 1. They should be Up to date on shots and vaccinations- This is important to make sure that the house is safe for all guests and their fur babies whom are staying. Puppies that are unvaccinationed should wait until they are up to date on shots before coming to stay. 2. Each dog has to be fixed- This is important to keep animals from marking the furniture and rugs (especially male dogs). We only permit dogs that are fixed to stay in order for us to keep the house in top condition for those staying with and without fur babies. 3. Your Fur Baby must be house trained- It is without question that your pups should be house trained… no animals are permitted who do any of their “dooty” inside. 4. No extreme barkers please- Our house is in a residential neighborhood so if your dog barks a lot and might disturb our neighbors, this would be a good trip to leave them at your own home. 5. Please Don’t leave them alone at the house for long periods of time: We have great dog sitters that can assist if you want to add a fun day trip to New Orleans, Gulfport, Ship Island or just take the day away from the pups. We are happy to pass on info for folks that can assist you with your long day plans away from the house to make sure your pups are getting the attention they need during the day. Guest Access: Renters will have access to the entire home, backyard, laundry room, front yard, driveway, etc. We ask that guests limit the number of vehicles they park in the driveway and along our front property line to 3 total cars (unless otherwise authorized by the owners). Host Interaction: We are available to answer any questions that may arise during your stay. We also have a detailed guest book that should assist with most of your questions as well. Other Things to Note: We are laid-back and amenable to a variety of personalities and people. Our house is comfortable and created with a lot of love and space for you to unwind and a focus on your personal relaxation. However, please be respectful of our space, of our neighbors and of yourself. We love dogs, so bring your little fur baby with you. The beaches in Hancock County are dog friendly. Let us know a bit about your fur baby when booking. There is a $50 pet fee. The massage chair is available to guests renting the property. We have a modest cancellation policy. Inclement weather, airline cancellations, illness and other circumstances occur when we least expect them. Please consider investing in travel insurance. Lastly, all guests are responsible for all covered losses during the reservation. All guests are obligated to pay for damages or losses caused by such responsible guest. The Neighborhood: We live in a residential beach neighborhood so life here is relaxed and at a slower pace (which is why we all want to come to the beach!). Our neighbors are friendly and will likely wave hello. The home is centrally located in Old Town Bay Saint Louis and only 3 blocks from the beach and from the center of the action on Beach Boulevard. The beaches that span from Bay St. Louis, through Waveland are dog friendly so take your fur baby with you to the beach. Our closest bar and restaurant The Blind Pirate and Sno Ball Stand is just 2 blocks away. A grocery store and store to purchase wine and other adult beverages is just a short 3 minute drive. There is a large park with a splash pad for kids (and adults) to enjoy just 2 blocks away. The Hollywood Casino and Golf Course are a 7 minute drive from the house. Getting Around: Getting around Old Town Bay Saint Louis is easy, it's a 10 minute walk to the beach, a 5 minute walk to the closest restaurant and bar, and 7 minutes to get to our favorite coffee shop. There is a free trolley that runs from Waveland to Bay St. Louis, with stops at the Silver Slipper Casino, Buccaneer State Park, Waveland Beaches and the shops and restaurants in Bay St. Louis. For a great beach town experience, cruise like a local on our 4-person golf cart which is free with your rental. The 2011 cart has been updated with new batteries so you can have plenty of power to get to your favorite beach destination, yacht club, or a day spent downtown shopping and dining. Lovely home with amazing views! Lovely home sleeps 7: queen bed in master, queen in second bedroom, bunk in 3rd bedroom with double bed on bottom and twin bed on top. Master bedroom has it's on bath. Open floor plan offers spacious indoor living area. 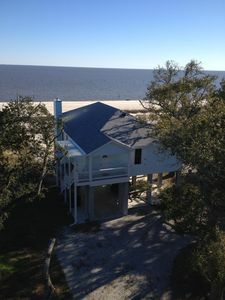 Large screened in porch on second floor allows you to enjoy gulf breezes and beautiful views. Or you may prefer to head downstairs where there is plenty of seating as well as a gas grill. A 2 minute walk gets to the beach. Spacious boardwalk is available for biking or walking. Less than a mile away is a public pier for fishing and boating. The kids will love Buccaneer State Park which is also less than a mile away. 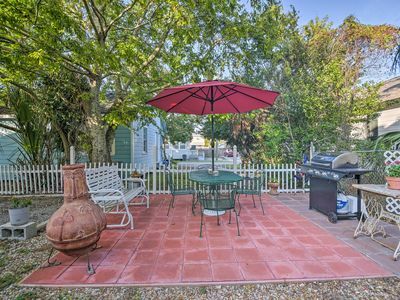 This 2-bed / 2-bath cottage is located in the heart of Old Town Bay St. Louis, and is in walking distance to all Old Town has to offer. This completely renovated property is just blocks away from the marina, beach, shops, restaurants, and bars. The master bedroom has a king size bed and an on-suite bath complete with shower, tub, double sinks, and a separate water closet. The second bedroom can sleep 5. There is a bunk bed with a full on bottom and twin on top, as well as another twin over twin bunk bed. The extra bath is right outside the second bedroom in a hallway that also features a laundry room with a full size washer/dryer. There is an office working space at the front of the house complete with a desk and plenty of space to set up a laptop. There is a large, fully functioning kitchen perfect for cooking, as well as a large outdoor grill under the carport area off the driveway. 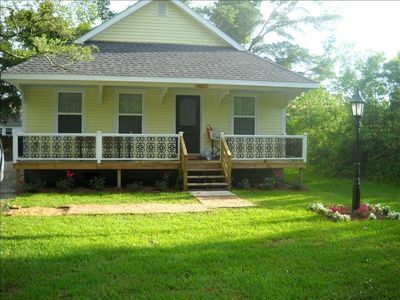 With a front porch and a back porch, including a large side yard, this house offers plenty of outdoor space. 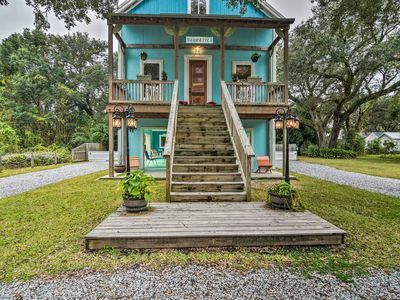 One of the architectural gems on the gulf coast, this former schoolhouse is just two blocks from the beach and close to the heart of Old Town Bay St. Louis. It's been renovated as one-of-a-kind duplex. 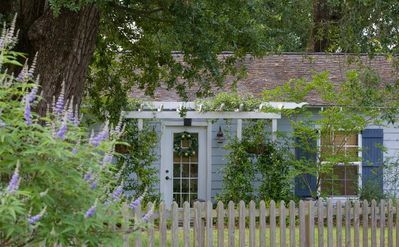 The architect/artist owners live on one side, while the guest rental side is nestled in the limbs of centuries-old live oaks on the other. Ask about our weekly and monthly rates (we rent only one month out in the winter to be able to accommodate our regular guests! The guest apartment has four private entrances, a front veranda, back deck, and nearly 1200 sq feet of open living space. This loft-style retreat features 12 ft. ceilings, clerestory windows, heart pine floors, a large library and an art collection by regional artists. If you like large, open, light living spaces and historic buildings, there's few that can match this. The main living area has an elegant and expansive feel. It contains a living room, dining room, partitioned off bedroom area. A wall of windows looks out onto oaks, while three windowed front doors open up onto a classic Southern veranda. The bedroom area has a queen-sized bed and the living room is furnished with a day-bed and pull-out trundle. The apartment sleeps three good friends, and is perfect for a couple. 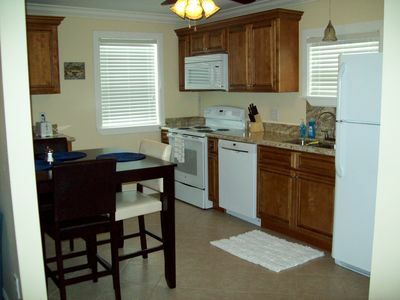 A large full kitchen (with full-sized appliances) and tiled bathroom complete the package. In the back, the kitchen door onto a deck beneath the oaks, a perfect place for morning coffee. The building's grounds cover nearly 3/4 of an acre and are shaded by the live oaks, as well as magnolias, azaleas and bottle brush trees. Ours may be one of the last authentic old-time neighborhoods this close to a beach anywhere in the country. It's just a two-block stroll to the beach, with its six-mile walking/biking path. Some people call Bay St. Louis "Mayberry by the Sea." It's a village that became a resort for New Orleanians when the train came through in the late 1800's. The tracks are one block from the house (they run parallel to the beach along the entire Mississippi coast) and the fanciful historic train depot is only two blocks away. The depot houses the Visitor's Center, a small Mardi Gras Museum and a museum dedicated to Alice Moseley, a beloved Mississippi folk artist. The Old Town district is filled with shops, art galleries, and restaurants all within two to nine blocks of Webb School. A lovely marina and fishing pier are new stars of "downtown." Canine companions are welcome many places in town, as well as on the beach (leashed). The beach is placid and rarely crowded - in fact, many days, you'll have a good stretch of it to yourself. When you have a yearning for big city culture, you're less than an hour from the New Orlean's French Quarter and the CBD, making for an easy commute. If you're not from the area, the owners - originally from New Orleans - can offer advice on day-tripping into the city. Day trips in the easterly direction will take you to Ocean Springs and Biloxi. 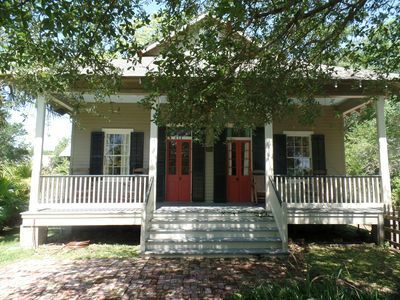 "Under Surge, Under Siege," (winner of the 2010 Eudora Welty Book Prize and MS Library Non-Fiction 2011 Author's Award) was written here in Webb School House by Ellis and published by University Press of Mississippi. If you're interested, you can find out more info on Amazon. Here's a description of the neighborhood from the book: "Ancient oaks lined the coast, framing large and elegant houses - many of them built in the 1800’s. Behind this dignified vanguard, cottages clustered along narrow, shaded lanes. These neighborhoods were mixed in more ways than one. Professors lived next door to plumbers, young families next to retirees, black next to white, rich next to poor. I loved that – it flew directly in the distorted face most outsiders have pasted on the state of Mississippi." "The architectural styles of the homes varied as much as the people who lived in them. Cheek to cheek, the Creole cottage danced with the Victorian, the Greek Revival with the bungalow. In those lush yards, you could imagine the lingering ghosts from an era of ease. They didn’t want to leave. Nobody who came here wanted to leave. This place pulled at the hearts of any who have them. It promised peace and made good on its word." Many have said that Webb School reminds them of a grand-scale tree house. Others talk about lingering "kid energy" that makes the heart feel lighter. Still other say their spirits are buoyed by all the light the building catches. But pretty much everybody agrees that Webb School is a place they'll never forget. 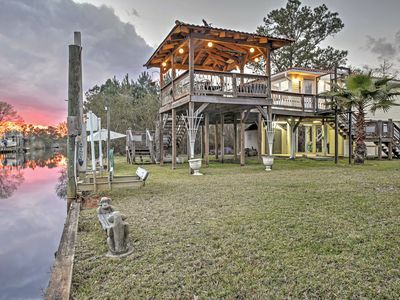 Beautiful home built on a manmade bayou. Fish from the dock or bring your boat! 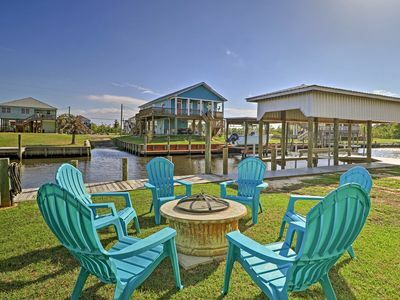 Relax on the back porch, take in the local sights in quaint Old Town Bay St Louis and shop while you are there for unique local art, go to the beaches just minutes away, try your luck at a local casino, take the ferry to Ship Island for the day, or travel to New Orleans only 56 minutes away (58 miles). Newer, modern, elevated home with all the amenities! Cook your meals in our full kitchen or dine on wonderful local cuisine minutes away. 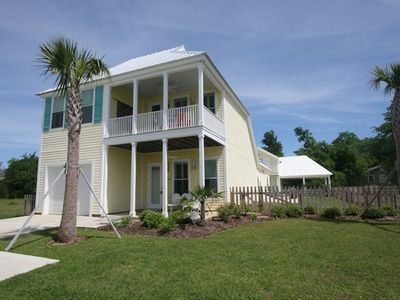 The Citrus House is a 4 bedroom, 3 bath house located near the heart of "Old Town" Bay St. Louis. The location provides a private setting very convenient to downtown. 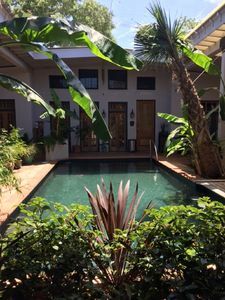 This house includes a private pool with a large patio, private garden and deck overlooking the pool. The living room is a warm & inviting space. There are 2 large sofas, comfortable chairs, & a flat screen TV with a DVR. The living room opens into a spacious dining room. The dining room table has seating for 8 people. This is the center of the open floor plan and is connected to both the living room and kitchen. These living areas are spacious & allow for natural sunlight. The kitchen has been renovated & is fully equipped with a set of earthenware dishes for 12, 2 sets of everyday stainless flatware, utensils, cookware, and barware. There are 2 sets of pots and pans and various pyrex dishware for baking. There is a large refrigerator with an icemaker. Appliances include an electric stove, dishwasher, and microwave. Small appliances include coffeemaker, toaster, crockpot and blender. The deck is accessed off of the kitchen and allows for outdoor dining. The deck also overlooks the pool and patio area. There are 4 well-appointed bedrooms that are very comfortable. The master bedroom entrance is at the end of the main hallway. The hallway entrance is off of the dining room. There is a king size bed with bedside tables and good lighting. There is a large dresser and a seating area. Also in the bedroom is a flat screen TV. The bedroom has large windows that allow natural light in the room. There is an en suite bathroom with two sinks and a bathtub/shower combination. This bedroom has thermal privacy curtains and blinds. The other two bedrooms off of the main hall are well appointed with queen beds, chests of drawers, night stands, bedside lamps, & generous closet space. The guest bedrooms have standard size windows with blinds and thermal curtains for privacy. These two bedrooms share a bathroom located off the hall with a shower/tub combination. The fourth bedroom is located in the back of the house and has a queen bed, a large armoire, and several windows with thermal privacy curtains and blinds. This bedroom has an ensuite bathroom with a pedestal sink and shower. It is handicap accessible. There is a utility room closet just off the kitchen & side door entrance to the house.The washer/dryer are housed in this closet. There is cabinet storage in this space. There are 5 bicycles on the premises available for the guests to use during their stay. We also offer helmets & a bicycle pump which are stored in the house. * Please note we have two other listings called "La Petite Cachette"-- 'Main House' (VRBO #489053) and there is also another accommodation in the upstairs 'Guest Quarters' (VRBO #472872) listed separately. *Pets are allowed on an individual basis. Please call for questions. We DO NOT allow parties, receptions or weddings, etc. on the premises. Guests must be at least 25 years old. If you have questions please contact us. Waterfront Home with a flair for comfort. 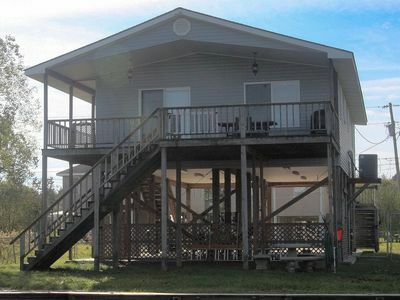 Three bedroom, two bath rooms with a roomy deck on the water side. Open kitchen, dining area and living room leading out to the deck. The living room has two reclining leather sofas and an ottoman which converts into a twin bed. Great area for family and or friend gatherings. Located in a quiet part of the Garden Isle neighborhood. It is a short ride to dining, shopping, parks, sand beaches and casino. By water it is only 15 minutes to the Bay of St. Louis and a 1/2 mile to Bay Marina where you can launch your boat, gas up and get bait. Nicely furnished, clean linens and towels. For those of you who do not want to take advantage of some of our fine restaurants, the kitchen is equipped for cooking if you prefer. The master bedroom and second bedroom, both have queen size beds. The third bedroom has twin over full bunk beds. So what are you waiting for. Come see us. You will not be disappointed. Check out our winter rates for nightly and monthly. 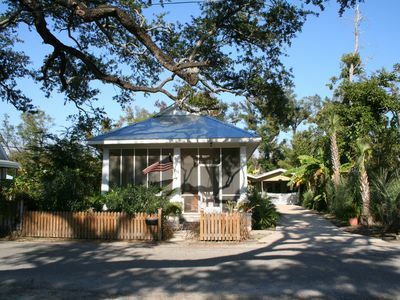 Relax and Enjoy a Welcoming Retreat in Peaceful Waveland. 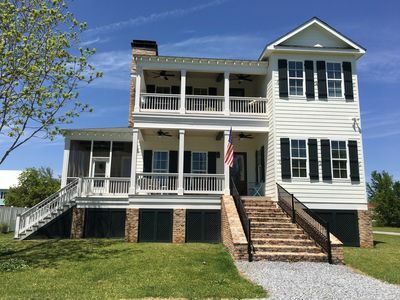 This two-story classic home built in 2015 has spectacular Gulf views from both its upper and lower front porches. A screened side porch has a wood burning fireplace for those chilly evenings when you want to sit outside and relax to the sound of the surf. We furnished it for our enjoyment and not just for a rental so hope you find it like staying in your own place. The downstairs living room is open to the kitchen and dining so is a great space for gathering. The smart tv above the wood-burning fireplace is connected to surround sound speakers. We have upgraded the technology to allow streaming from your own devices. French doors open to the screen porch which has speakers as well. The upstairs great room has a large seating area with three convertible beds, and large tv, making this home ideal for multiple families vacationing together. There is a desk with multiple monitors that works with a Surface if you need it. The fully equipped kitchen has a Wolf five-burner gas stove and double convection oven. The large island is perfect for appetizers, pancakes for the kids, or buffet style dining. A wet bar with a built in wine cooler and ice machine make for fun and easy entertaining. Out back is a large grill for searing steaks and has a side burner for boiling seafood. All bedrooms have adjoining baths and large closets. The master bath has a claw foot tub, two separate sinks and a large rain shower, One upstairs bath has a walk in rain shower and the other has a tub/shower combination. There are chairs for the beach in the shed and coolers, plus a wagon for hauling them down to the beach. Two bicycles, a few sand toys and a shade tent are for your use as well. With few neighbors there is plenty of outside space for family football games or just running around. The beach is only one lot away, the Waveland fishing pier is 0.5 miles and Main St. Bay St. Louis is 2.2 miles. Silver Slipper Casino is 5 miles along the beach road and they run a shuttle service that will take you from there to downtown Bay St. Louis. For more excitement, a trip to New Orleans is only an hour’s drive. Or enjoy one of the many nature preserves in the area. Watch for the bald eagles, owls, bluebirds and fox squirrels! We hope you enjoy our place as much as we do. You will feel transported to a tropical Island when you arrive at this property. This listing is for the Main House only. You can see our separate listing on VRBO to rent one or all of the Studios individually or the whole property if you have a large group or family. All guest will have access to the patio/pool area. The Main house features 2000 sq ft. with 2 bedrooms and 2 baths, an in ground pool and courtyard just off of the kitchen area. The french doors in the kitchen open out onto the courtyard and pool. You can sit at the 40' long wrap around bar in the gourmet kitchen while you enjoy the view of the pool or watch the kids swim while you cook dinner. After dinner you can retreat to the Media Room to play pool or watch TV on the large 55" Flat Screen. If you are traveling with a large family this home also has 2 separate studio apartments available to rent on our separate listing with VRBO in addition to the main house or individually. The studio's each feature 1 bedroom and 1 bath and share the courtyard and pool with the main house. These studio's are also available to rent separately from the main house to additional families when available. The Abode definitely has a tropical vacation setting where you can sit back and relax . The beautiful beaches of Bay St.Louis, MS. are located only a 1/2 block away. After a day at the beach you can walk to Old Town Bay St.Louis for an afternoon coffee and pastries, do some antique shopping and eat at one of the many restaurants. You are sure to fall in love with Bay St.Louis, a quite town filled with lots of charm and character. In the local area there are plenty of things to do: Antiquing, shopping, outlet malls, The Bridges Golf Club, tennis, boating, deep sea fishing, sailing, art galleries, canoeing, swimming, fishing, the beaches are pet friendly and casino's. Bay St.Louis is located only 1 hour from New Orleans, LA. 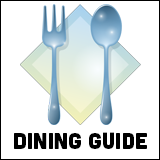 where you can visit the Historic French Quarter, Aquarium of the America's, The World War II Museum, IMAX Theater, Audubon Zoo, famous New Orleans Restaurants and the Children's Museum. If you do visit New Orleans ask about our French Quarter Apartment available to rent for your visit. Ask about our Golf Cart, bike, canoe and Kayak rentals for your stay. Daily & Weekly rates PLEASE CONTACT OWNER FOR AVAILABLE DATES..... 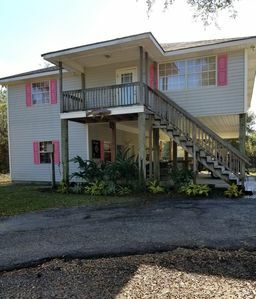 Check out my other listings in Bay St.Louis on VRBO LIsting #157268, 379548, 709534, 1062096, 352392, 471992, 1242807, 1278808 Please Note: This house is pet friendly and is cleaned thoroughly after each rental. If you have severe allergies this house may not be for you. Elegant, spacious suite with private entrance. Old Town BSL, walk to everything! 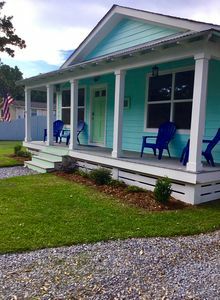 'The Cottage' features 1 bedroom/1 bath (maximum occupancy of 3 ADULTS) with all the modern amenities just 1/2 block from the beach, fishing pier, boat launch and a 10 minute walk to Old Town. 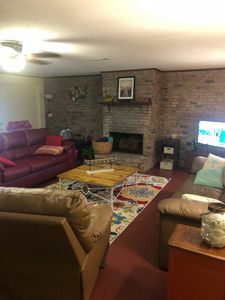 Queen bed in the bedroom, queen sized sleeper sofa with memory foam mattress in living area, bathroom and kitchen, dining area (seating for 4), large front porch with two rocking chairs, private back deck/yard and charcoal grill. Flat screen TV in living room and bedroom, fully equipped kitchen with dishwasher, microwave, stove/oven, coffee maker, blender, hand mixer, crock pot, single serve blender and full sized washer and dryer. We are NOT a pet friendly home. Interested in what our guest's have to say? Read our 5 star reviews! Our home features custom cabinets. In addition, we have antiques and handmade furniture throughout the house. Kitchen is custom built with everyday dishes and fine dining service pieces. Bath and electrical fixtures are upgrade. There is a spacious screened porch and a deck for relaxing and grilling. Full size laundry machines are included. All linens and cooking needs are on hand. Microwave, hair dryers, cable tv and wireless internet are included. Welcome to picturesque Bay Oaks Place! Our home, built in 2015, has ceramic tile throughout the entire house, quartz kitchen counter tops and ceramic tile in all three bathrooms. The master suite features a king-sized bed and attached private bath with walk-in shower. Additionally, the second bedroom also has a king-sized bed with adjoining full bath. The third bedroom has a queen sized bed, with views over-looking Beach Boulevard, and attached full bath. The fourth bedroom, or the bunk room as we like to call it, features two bunk beds. The bottom bunks are full-sized with a roomy twin on top, with access the full bath also attached to the second bedroom. All four bedrooms have a 32 inch with cable access. The open concept great room features floor-to-ceiling windows surrounding the room to allow for views of the Gulf of Mexico and the white sand beaches of Bay Saint Louis. Deck chairs are located just outside the front door, so you can overlook the beach while enjoying your morning coffee. Additionally, the covered area downstairs has a table and chairs that can fit all your friends and family to enjoy the great outdoors in comfort. This area is also paved, with a gravel drive leading up to the house. You’ll never have an issue parking your vehicles or boat trailers in this prime location. The quaint shops of historic Old Town Bay Saint Louis are only a few minutes away by car. With a large collection of bars and restaurants, and a state of the art Marina, Old Town is the perfect place for pier fishing, people watching, or just relaxing. Bay Saint Louis is also home to two casinos, The Hollywood and The Silver Slipper. If you’re a golfer, head over to The Hollywood to check out The Bridges Golf Club, Mississippi’s only Arnold Palmer Signature golf course. Gulfport is only twenty miles to the east, where you could get your shopping fix in at the Gulfport Premier Outlets or cool off at the Gulf Islands Water Park. New Orleans and all of it’s attractions is only fifty miles away. Your possibilities for entertainment are endless. Bay Oaks Place is a non-smoking home, but smoking is allowed outside with receptacles for your cigarette butts provided. ONE, small, well mannered, adult dogs under 25 pounds are welcomed. Sorry, the cats need to stay at home due to the homeowner’s allergies. There is a non-refundable pet fee required. The minimum rentals age is 25, and the maximum occupancy of 12 (adults and children) at all times is strictly enforced. We want you to enjoy our home and your time at Bay Oaks Place, but no events or parties are allowed. 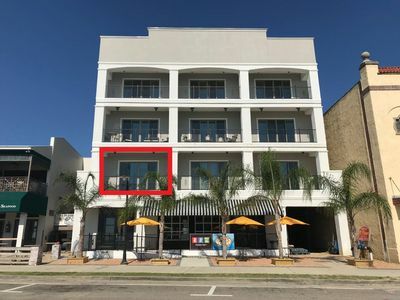 This 2nd story, downtown apartment sits one block from the beach and one block off main street in historical Bay St. Louis. It's an easy walk to small shops, bar's and cafe's. The Ugly Pirate Bar and Cafe is just downstairs. Weekend music is just a walk outside your door. This newly renovated apartment sleeps up to 6 comfortably. This apartment features 2 bedrooms, a sofa sleeper, 1 bath, a kitchen and cozy living room. Washer and dryer are available for your convenience. There is no smoking and no pets allowed. Cable TV and internet are provided. If you are interested in riding bicycles, 2 are available for you. Golf Carts are welcomed in this small town. Come and enjoy staying in a newly constructed home. It has a fully equipped kitchen with stainless appliances, granite counter tops and is well stocked with dishes, pots, pans, and small appliances. There is a 50 inch Smart TV with cable plus WiFi along with a DVD player for your entertainment viewing pleasure. We also supply plenty of clean fresh towels and linens. This home has two bedrooms and 2 full bathrooms. The master bedroom is very spacious with a queen size bed, private bath, with a walk in closet. The guest bedroom also has a queen size bed. Both bedrooms lead out to a porch where you can relax with a cup of coffee in the morning. There is still yet another porch on the opposite side of the house off the dining room and den areas where you can enjoy kicking back in a couple of rocking chairs and watch the ducks and boats go by. Underneath the house there is a picnic table and chairs with plenty of room to relax, cook out, gather, and enjoy the outdoors (in the shade). The boat launch is across the street and the boat ride is only minutes away (idling speed) from Bayou Lacroix and the Jordan River. Old Town Bay St. Louis area is just minutes away where there are plenty of great restaurants and entertainment, bar and grills, shopping, art galleries, antique shops, casinos, golfing, fishing charters, boat rentals, water park, and much more. 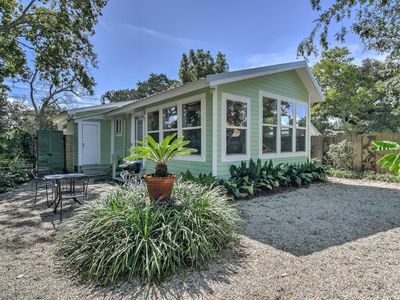 Nestled in a live oak, this one bedroom/one bath home is perfect for a "couples getaway" on a quiet wooded lot only 2 blocks from the beach. 15' in the air and surrounded by windows, you'll see birds, butterflies, and hummingbirds as they sing and feed on the nectar in the garden below! We provide 2 bikes so you can enjoy a morning ride to Bay St Louis for breakfast or a sunset pedal on the many paths provided.!!!! The beach is protected by barrier islands and fed by the Jordan River so it is nutrient rich (great for fishing and birding) and much more like a bay. Our garden is a work in progress with native longleaf pines, coastal prairie field, and various herbs for cocktails. In this raised bed you will find fresh mint and rosemary to create a refreshing afternoon with grapefruit and lime (and your preferred libation) you'll be relaxing in the summer breeze in no time! Please note this an ADULT ONLY (2 adults max) and absolutely NO PETS due to severe allergies and our effort to maintain the natural wildlife which you rarely see in an urban environment,. Not adhering to these rules will result in an automatic loss of deposit. Please confirm these when booking! Check IN 4pm - Check OUT NOON. We are happy to accommodate earlier/later if we can, but you will need prior approval. Additional linens and towels (other than those provided in bathroom) will accrue an additional cost of $15/sheet set and $5/towel that will be taken out of deposit.